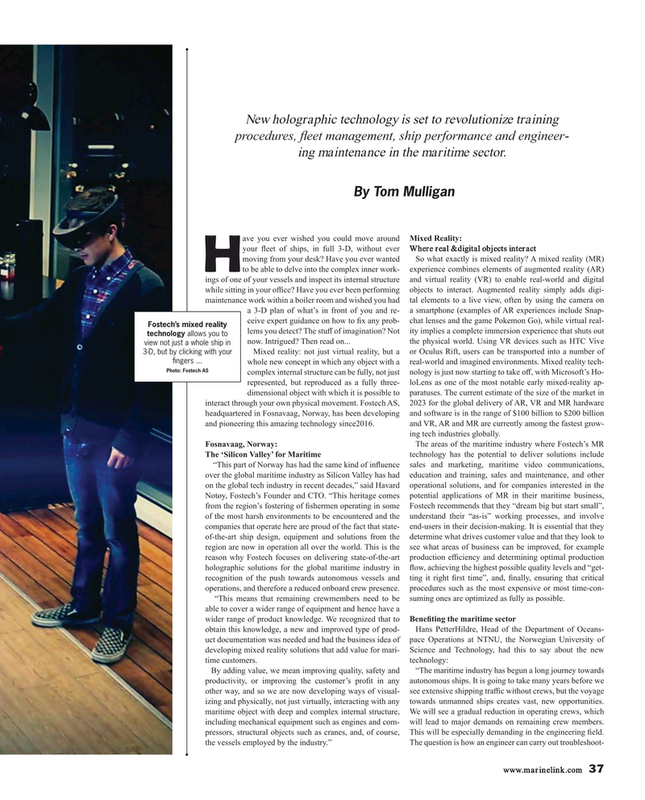 New holographic technology is set to revolutionize training procedures, feet management, ship performance and engineer- ing maintenance in the maritime sector. Photo: Fostech AS complex internal structure can be fully, not just nology is just now starting to take of, with Microsoft’s Ho- represented, but reproduced as a fully three- loLens as one of the most notable early mixed-reality ap- dimensional object with which it is possible to paratuses. The current estimate of the size of the market in interact through your own physical movement. Fostech AS, 2023 for the global delivery of AR, VR and MR hardware headquartered in Fosnavaag, Norway, has been developing and software is in the range of $100 billion to $200 billion and pioneering this amazing technology since2016. and VR, AR and MR are currently among the fastest grow- ing tech industries globally. Notøy, Fostech’s Founder and CTO. “This heritage comes potential applications of MR in their maritime business, from the region’s fostering of fshermen operating in some Fostech recommends that they “dream big but start small”, of the most harsh environments to be encountered and the understand their “as-is” working processes, and involve companies that operate here are proud of the fact that state- end-users in their decision-making. It is essential that they of-the-art ship design, equipment and solutions from the determine what drives customer value and that they look to region are now in operation all over the world. This is the see what areas of business can be improved, for example reason why Fostech focuses on delivering state-of-the-art production efciency and determining optimal production holographic solutions for the global maritime industry in fow, achieving the highest possible quality levels and “get- recognition of the push towards autonomous vessels and ting it right frst time”, and, fnally, ensuring that critical operations, and therefore a reduced onboard crew presence. procedures such as the most expensive or most time-con- “This means that remaining crewmembers need to be suming ones are optimized as fully as possible.